Provide comfort for the family of Betty Horne with a meaningful gesture of sympathy. To send flowers in memory of Betty C. Horne (Hurt), please visit our Heartfelt Sympathies Store. Donations are being accepted for: Caris Health Hospice. Consider providing a gift of comfort for the family of Betty Horne by sending flowers. Provide comfort for the family of Betty C. Horne (Hurt) by sending flowers. 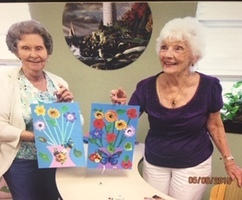 Betty became a much needed "buddy" for our mom while they were both at the Villages of Jackson Creek. They had so much fun together and I remember my mom being so sad when suddenly one day Betty was gone. Betty has a special place in the hearts of Retha's family. I believe the lesson to be learned is that no matter the path a life takes, there's always an opportunity to be a friend to someone. Our thoughts and prayers are with your family.